Skin Needling Collagen Induction Therapy at LAB Skin Clinic, Neutral Bay – call 02 9909 3602 – integrates the latest and most advanced skin needling turbo-pen technology with Nobel Prize-winning and 99% pure growth factor to deliver superior medically proven results. Skin needling, commonly referred to as micro-needling or collagen induction therapy (CIT) is effectively used to treat a variety of skin problems as well as reversing and preventing the signs of skin ageing – especially increasing collagen. Almost a thousand times more powerful than your skin’s own natural ability, the dynamic combination of micro-needling and Da Vinci 21 Growth Factor Serum (which has been genetically engineered and bio-medically formulated to be 99% pure and all-natural) produces massive amounts of collagen and transforms your skin quickly, safely and effectively… and with no downtime. LEFT: This untouched photo of a client, first photographed in 2012, was taken in 2017 after a series of skin needling treatments. She looks 10 years younger than she did 5 years ago… and is often mistaken as her oldest daughter’s sister! She is just one of many hundreds of clients who get these amazing results. The Eclipse Elite Turbo Pen needling system is the very latest evolution in micro-needling (frequently called collagen induction therapy – CIT), which creates micro-channels in which the growth factor serum is delivered transdermally to the dermis to restore the skins cell matrix. 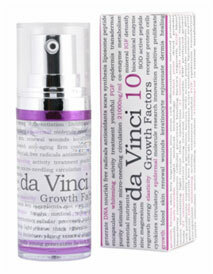 We recommend Da Vinci 10 Growth Factor Serum home care, to improve and accelerate the results of your in-clinic treatment. 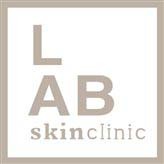 At L.A.B Skin Clinic, we have a broad range of proven, medical-grade technologies and cosmeceuticals that deliver controlled and predictable outcomes on all skin types. Treatments effectively address both the symptoms and the causes… while simultaneously reducing and preventing signs of ageing … And pleasantly… there is almost no treatment downtime. At L.A.B Skin Clinic, you get a 100% RESULTS guarantee – a sign that we have the ability to deliver you positive and effective long-term results. Come in for a complimentary consultation and tell us what your concerns are, or book a detailed skin diagnostic evaluation now on 02 9909 3602, to find out how you can have flawless and problem-free skin. The Automated Eclipse MicroPen™ Micro-Needling System (micro-needling is sometimes known as Collagen Induction Therapy or CIT) is a new innovation in aesthetic medicine for the treatment of fine lines & wrinkles, acne scars and the overall improvement of the skin’s texture, tone and colour. During the micro-needling procedure, controlled micro-channels are created, which allow topical Da Vinci 21 growth factor serum to be absorbed more effectively – thereby enhancing their effects in the deeper layers (dermis) of the skin. The skin’s repair process is then activated to produce a thicker epidermis with softer wrinkles. Younger patients may require a single treatment once per year to achieve optimal results. However, it is recommended for most patients to receive a series of three treatments spaced about three weeks apart. 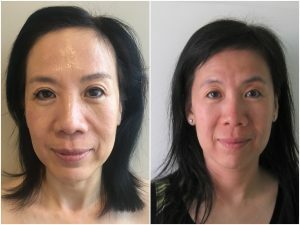 Older patients with deep wrinkles, advanced photo-ageing, stretch marks or acne/surgical scars will need to receive from six to ten sessions at weekly intervals. You will be advised at the time of consultation. No, not for most clients; most clients describe it differently, but most say our techniques make it comfortable and it is highly tolerable with the sensation being described as similar to a spikey brush being moved across the skin. While some areas are more sensitive than others, the speed of the reciprocating needle tip makes the treatment comfortable. Immediately after the treatment, you will be given an Omnilux treatment, which reduces redness, although you may notice a blush/pinkness to your skin. Your total healing time depends upon the depth of needles used and the number of overlapping passes your skincare professional performs. On average, most patients heal completely within 24 hours, although some patients can be blemished for up to 2 days (sometimes up to 4 days after more aggressive treatments). By following the L.A.B Skin Clinic Dermal Recovery Treatment System you will enhance the healing and recovery process by a significant factor. 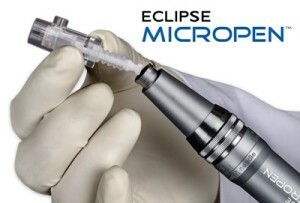 A fully self-contained, single-use sterile micro-needle tip is attached to the Eclipse MicroPen™. Your skincare professional will apply a thin layer of topical hyaluronic gel to your skin and select the appropriate treatment depth based on your specific skin’s needs. Next, in a single motion, the pen will be gently placed upon and guided across the skin in multi-directional passes until the entire treatment area has been covered. The procedure takes 15-30 minutes depending on the size of the treatment area. You will notice an immediate “glow” and visible changes will continue to develop over the course of several weeks. Results typically continue to improve up to six months after the treatment as collagen production continues. Maintenance is required but will vary according to age. Come in for a detailed skin evaluation by calling now on 02 9909 3602 or book online by clicking on the link below to find out how you can have flawless and problem-free skin.